6 Weird Ways To Approach Your Writing How Do I Format An Interruption In My Screenplay Dialogue? Got a treat for you today Bang2writers! 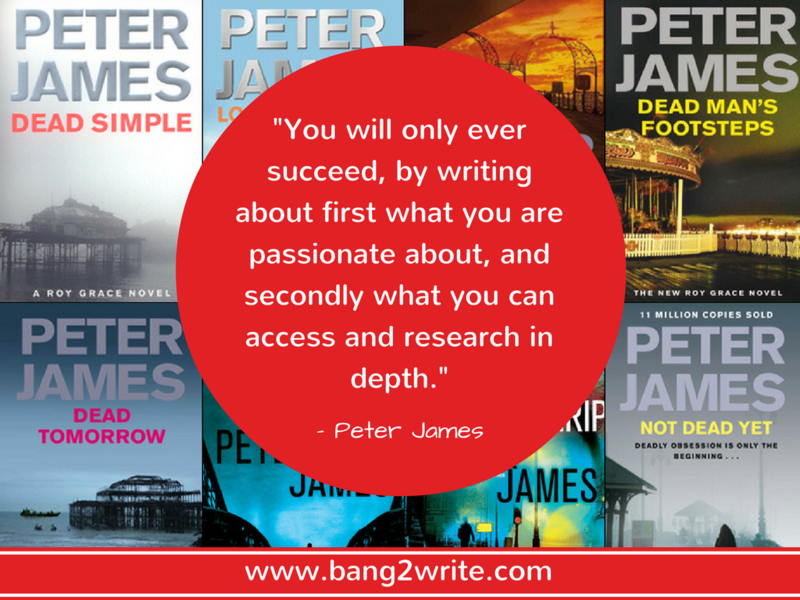 The awesome Peter James is offering us his expansive writing knowledge! If you don’t know who Peter is, FOR SHAME! Peter is probably THE top selling British author of the moment and most recently he won the coveted 2016 CWA Diamond Dagger for sustained excellence, plus he was publicly voted by WHSmith readers The Best Crime Author Of All Time. I realized that looking at a map or at photographs will tell you what a place looks like, but nothing other than actually being there can tell you what it smells like, sounds like, feels like. I vowed then and there that never again would I write about anywhere that I had not visited, nor anything that I had not in some way experienced – death excepted. Peter’s Top Tip: Always try and visit the places you write about to give them authenticity. Nothing loses me faster as a reader than to realize part way through a book the writer has not done the research. An example of this was a US thriller writer, who I shall not name (!) who some years ago set a novel in England. At one point he had his central character driving his car up a road towards Birmingham, getting closer with every mile. He named the road as the M25. But, the M25 is the ring road around London!!!!! You could drive around it 24/7 for the next ten years and still not get any nearer to Birmingham. At that point I thought, OK, if the author hasn’t even bothered to look at a road map, do I really want to bother continuing with this book? And I didn’t. Peter’s Top Tip: Never underestimate local knowledge and experience. In 1977 I read a newspaper article saying there was a shortage of spy thrillers. So I decided to write one, thinking there was an opportunity. Dead Letter Drop was published by a major house, WH Allen, in 1981 but sold only a handful of copies. The total print run was 1800 of which about 1500 went to public libraries. The next two did equally badly. I poured my heart out to a friend working then at Penguin (Elizabeth Buchan, who went on to become a hugely successful writer herself) and she said to me, “Why are you writing spy thrillers? What can you ever know about the world of spies? You’re up against writers like John Le Carré who’d worked in the Intelligence services, who have an inside knowledge you will never have. You will only ever succeed,’ she said, ‘By writing about first what you are passionate about, and secondly what you can access and research in depth.’ She was right. Peter’s Top Tip: Write what you love and the rest will follow. 4) Leave in all the details! There is always the decision about how much of what you’ve researched you leave in and how much you delete. The temptation is always to leave far too much in, but often that is damaging to the pace of the story. You as an author may think, Look at me, I know all this stuff, how clever am I??? But the reader will be thinking, Do I really need to wade through six pages of detail taken from the maintenance manual of an AK47??? I think the decision is an easy one, actually. I have an invisible sign in front of me for every line I write in a novel: DOES IT DRIVE THE NARRATIVE FORWARD? Peter’s Top Tip: Like most things writing-related, less really is more when it comes to research. Cherry pick the best tidbits of info that push the story forward. A golden rule to remember is that TV very rarely gets anything right. That old adage, Never let the truth get in the way of a good story applies to a lot of novels, but even more so to movies and to television drama. Writers, producers and directors alter the facts to suit what in their view makes the best drama – and to hell with realism. Nowhere is this more prevalent than in crime dramas. An example is the first episode of Broadchurch. A small boy has fallen off a cliff and lies dead on the beach below. We see that the police have put a crime scene tape sealing access off. Correct. They have erected a Crime Scene tent over the body. Correct. We see a couple of CSIs emerge from the tent in their protective onesies, overshoes and gloves. Correct. Then out comes the Senior Investigating Officer, David Tennant, in a mackintosh, dark trousers and black shoes – his normal clothes. Absolute tosh! He would not have been allowed inside that cordon without full protective clothing. Not even the Chief Constable would have: Nor as an SIO would Tennant in real life have wanted to enter that cordon like that. The whole point of the cordon and the tent is to protect the crime scene for the most minute pieces of possible evidence. Those paper suits that police and CSIs put on are to prevent them from contaminating the crime scene with their own skin cells, hair follicles, clothing fibres, etc. Yet how many times have we seen scenes like this? Does it matter to be so detailed? Well, there are 250,000 police officers and support staff in the UK. If they read a book where the author has got aspects of their work blatantly wrong through poor research, they’ll ditch it and never read that author again. That’s a lot of people in the audience to pee off in one go! Peter’s Top Tip: Sacrifice facts for drama – but never go too far, or get the basics wrong. These are all classic mistakes an author can make – I know, I’ve made all of them! By their very nature, readers are intelligent people, and I have always taken the view that the most satisfying books are those where, when you have finally finished, you realize you’ve not just read a great story, you’ve also learned something new about the world we live in and about human nature. For this to happen the reader must believe they are in safe hands, an author who really knows what he or she is saying. 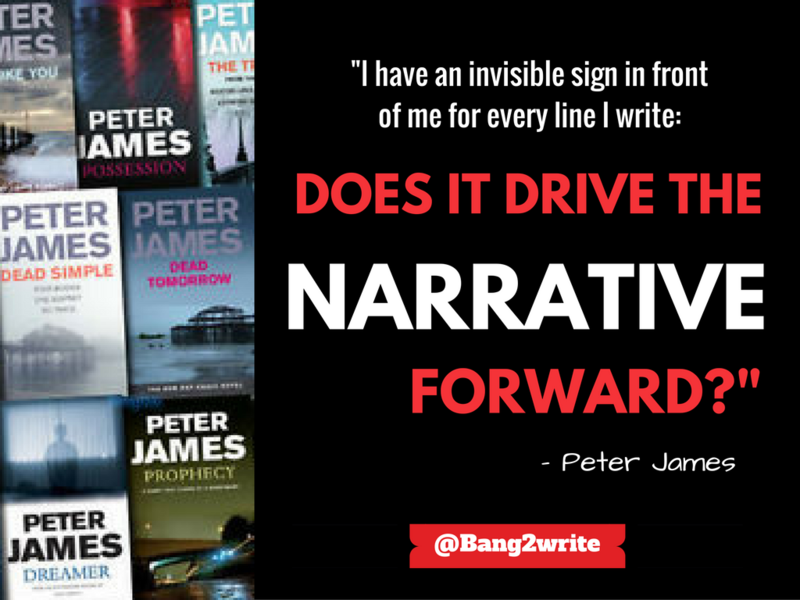 BIO: Peter James is an international bestselling thriller writer with 11 consecutive Sunday Times No 1s, published in 37 languages, as well as being a New York Times bestseller. His DS Roy Grace crime novels have sold 18 million copies worldwide. He lives in Notting Hill, London and near Brighton, Sussex with his wife Lara and menagerie including two dogs, five alpacas, seven chickens and a psycho cat. Check out his Youtube channel for writing insights and interviews with top authors, HERE , follow him as @peterjamesuk on Twitter and on instagram HERE. Useful article, Peter. Thank you. I know it’s cheeky of an inexperienced writer like me to pick holes in the work of someone with your long career (although reassuring to know that even you make basic mistakes!). Your last sentence begins “The following …”. Ahem!